Gosh, is it Friday already? Well here's two more delightful free games to play. William and Sly 2 is a lovely game you can play in your web browser. 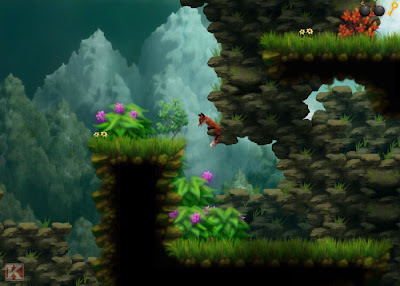 It's a platform game with lots of jumping round, but it's a very pleasant and soothing experience. The music is perfectly suited and there's no real danger. The game doesn't make it terribly clear what it expects of you, but the joy is in simply exploring at a relaxed pace. I didn't play the first game and I've no idea of the back-story. You're a fox and there's some guy on a deckchair. Now you might imagine that you can guess who's who, but I decided to confound the vulpine stereotyping and let the fox be William. Seeing as the bloke just sits on his arse the whole time, I reckon he's the one being sly. The animation is beautiful and fluid and the puzzles genuinely fun to try to solve. You play it in your browser and it's even smart enough to remember where you left off without you having to save or anything, which is a nice touch. You're a dog. A Russian dog. You live in the subway. People get off trains. Some of them eat food, other drink vodka. Bark behind someone and they'll throw whatever they're carrying into the air. Food is yummy and keeps your health up and vodka explodes. There are rival dogs and you'll want to jump into the air to grab the food before they do. Exploding vodka kills other dogs. That's all there is to it. 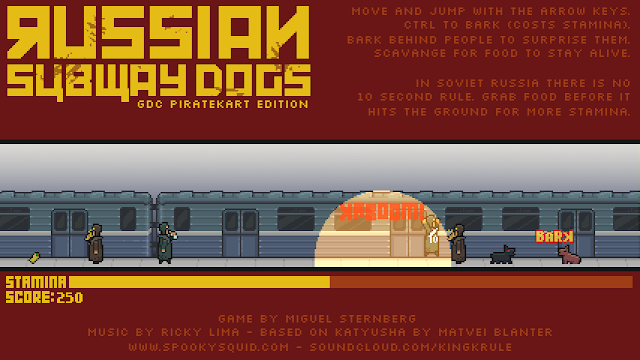 Apparently in Russia there are indeed dogs living in the subways and it's getting to be quite a problem. But I don't care because they're delightful.